This is a transcript of SYS Podcast Episode 047: An Interview With Writer / Director Jeremy Culver. Ashley: Welcome to episode 47 of the Selling Your Screenplay podcast. I’m Ashley Scott Meyers, screenwriter and blogger, over at sellingyourscreenplay.com. In this episode’s main segment, I’m interviewing Jeremy Culver. Jeremy is a writer and director who just completed an independent film called “Evergreen Christmas”. We get into some real detail about how his film came together so stay tuned for that. If you find this episode valuable, please help me out by giving a review on ITunes or leaving a comment on YouTube or re-tweeting the podcast on Twitter or liking us on Facebook. These social media shares really do help spread the word about the podcast so they are greatly appreciated. I’d like to thank over on ITunes. I got two very nice reviews. Thank you to Majust 1 and Michelle Kinor, both left me really nice reviews and I really do appreciate those. Over on YouTube, thank you to Robert Kylie and Eunice Alferis who left me some nice comments on episode 44. Thank you, guys, for those, and on Twitter Ink Moves re-tweeted episode 43. Thank you for the re-tweet, and on Facebook Nahin Swatorin Rato and Serita Johnson and Ray Chen, all liked some of the recent episodes so thank you all for that. Our Facebook page is growing nicely so please do like it if you get a chance. A couple of quick notes. Any websites or links I mention in the podcast can be found on my blog in the show notes. I also publish a transcript with every episode in case you’d rather read the show or look at something later on. You can find all the podcast show notes at www.sellingyourscreenplay.com/podcasts and then just look for episode 47. 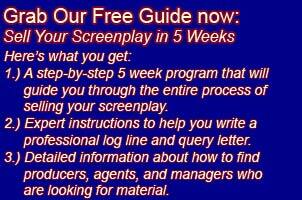 Also, if you want my free guide “How to Sell a Screenplay in Five Weeks”, you can pick that up by going to sellingyourscreenplay.com/guide. It’s completely free. You just put in your email address and I’ll send you a new lesson once per week for five weeks along with a bunch of bonus lessons. I teach the whole process of how to sell your screenplay in that guide, how to write a professional log line inquiry letter, how to find agents, managers, and producers who are looking for material. It really is everything you need to know to sell your screenplay. Just go to sellingyourscreenplay.com/guide. A quick few words about what I’m working on. I’ve actually been spending most of my writing time recently writing a big budget studio action adventure Sci-Fi film. We’re still in flux on our pitch but right now we’re pitching it as Men in Black Meets ET. I’m working with another writer on this project. It’s the writer who runs the writers group that I’m in. Hopefully the whole will be greater than the sum of its parts, at least that’s the idea. At this point I’ve got several low-budget projects that I’m trying to get out there so I feel like trying something totally different while having a market to different types of producers and hopefully expand my reach a bit. We’re hoping to have a draft done by the end of the year but that’s looking less and less likely, certainly by early next year, I would say late January at the latest, we’ll hopefully have a nice draft of this script done. So now let’s get into the main segment. Today I’m talking with writer/director Jeremy Culver. Here is the interview. Ashley: Welcome, Jeremy, to the Selling Your Screenplay podcast. I really appreciate you coming on the show. Jeremy: Thanks for having me. I’m looking forward to talking with you. Ashley: So, to start out, I wonder if you can give us a quick overview of your career in the entertainment industry and how you got started. Jeremy: I actually came to the entertainment aspect of it relatively later. I didn’t come up through the film school route. I did come up doing production and have a degree in production and from there I started doing probably a pretty typical route where you start doing commercials and that leads to one thing that leads to another and you start doing bigger and bigger commercials. I had also done a lot of multimedia family businesses, computer-based training where we designed courseware and designed the classroom of the 21st century kind of thing and did these big installations so there was also the multimedia component to that and so production was always part of my vocabulary from college on. Then you just kind of wake up and say you just really want—on the commercial side I was having a difficult time creating content for products that I really didn’t believe in and some people are wired that way and they can find a passion in the process but the passion in the process just kind of went away from me. And I really wanted to focus on material that I wanted to be a part of and give myself to and that’s when I stepped into writing. Ashley: So let’s just go back and take us back to the beginning just so people kind of have maybe an idea of the scope. So where you were a film major and got into basically commercials and industrials right out of college and, I assume, right out of college that means you basically started as a production assistant and then worked your way up. Maybe just give us a little bit of background like real specifics on what exactly that looked like once you kind of started professionally in production. Jeremy: Actually my degree is more in television production so it wasn’t a film base; it was a television or studio-based type thing. I was very fortunate that right out of college I started my own production company. I had an entrepreneurial background with the family and had some content to immediately start working on with the multimedia side–this was in the Philadelphia area—so I started on the commercial side doing commercials for Comcast clients, and Comcast had their ad sales. So there were production companies who would support those clients and I was fortunate enough to make a good presentation to some of the sales reps and they started referring me to clients and that’s really how I got started on the commercial side. I was very fortunate that I was able to start my own business. There were a lot of lessons. I mean, an education’s expensive whether you get it in college or whether you get it in the real world, and my education certainly wasn’t cheap. Ashley: So then you were literally directing and producing those commercials and that kind of gave you sort of the production chops to slowly move into features. Jeremy: I mean, the great thing about film is that there are so many hats you need to wear from the creative side and a very diplomatic side to it in dealing with people and there is also obviously the technology side. I believe you really have to have a vocabulary in all of those areas and so doing those commercials and directing and producing the commercials and editing the commercials that I actually built myself because I had the money to go out and buy a really expensive one so I just built one and built the premiere platform [not understood 0:7:22.7] and move into at the time was called the [not understood 0:7:26.4] that was since discontinued but they do smoke and fire, that line of products. So I got real hands-on training in all aspects of production together all the way from the pre all the way to the post and I was really responsible for all aspects of that in the beginning. Ashley: Okay. So now take us back to sort of that moment. So you wake up one day and you’re sitting there thinking I really want to do something more on the feature film and other things. Did you start writing? Had you been writing screenplays for a while? What was your first step to make that transition from commercials to features? Jeremy: It was Charlene Clossey who starred in the film was actually my fiancée and we’d been together for a while and so there’s an artistic side in all our conversations at that point. And at this point I was doing the national commercial-type stuff. I did something with Hooked on Phonics which is a great project and a great product, but I had a couple bad experiences with some other projects. It was just like you know, I just don’t want to do this. This isn’t who I want to be. We were living in LA at the time and Charlene was doing a lot of theatre and just started networking and just started talking to people and came across a gentleman who had this idea for a short film that he wanted to do. He lived in Malibu and so I just sat down and I talked to him creatively about how I’d do it and he really liked the idea and so he hired me to help him write the screenplay and direct it. He was an older gentleman who was still out hiking, and that was amazing. He had a Ph.D. in philosophy from Cornell, a real breadth of experience and he was a poet. That was my first short film and it was called “Walking with Francis”, the last days of St. Francis of Assisi. So the real meaty subject from a historical subject to dive into. And at the time my sister, who is actually ten years younger than I, she had the creative writing degree from Rawlins College in Florida. And she and I were approached about an idea that we had which ended up being an Evergreen Christmas by a producer and so that was our first screenplay actually that we started rushing. Ashley: Walking with Francis or an Evergreen Christmas? Jeremy: An Evergreen Christmas was the first feature screenplay that we had. I mean, we’ve written a number since and throughout the process we were always writing other ideas but that’s the first one that we actually started and pitched the idea and really just went through the process. We wrote it on and off for about a year. Ashley: So let’s dive into An Evergreen Christmas. Maybe first you can kind of pitch us a log line or a quick synopsis or an idea of what the story is about. Jeremy: An Evergreen Christmas is a story of a young woman named Evie Lee who comes from a small town in Tennessee and she has moved to Los Angeles to pursue her music dreams. And we meet her in Los Angeles and she’s really just basically a PA for kind of a Lady Gaga archetype, and she gets the unfortunate news that her father has suddenly passed away so she needs to go back to the small town. Her family owns a Christmas tree farm so she needs to go back to this small town for her father’s funeral. While there she learns that she is actually made the executor of the estate and because there is the estate tax there is a problem. If the situation isn’t resolved and a solution isn’t found, then the family would lose its farm. And now this is all her responsibility. So through the process of figuring this problem out, re-connecting with her family, with her younger brother who is also a musician but stayed there so there’s a lot of resentment on his part. So through the process of figuring the solution to this problem, she re-connects with her roots, not only from a family standpoint but also from a musical standpoint and really fulfills all the goals that she had set out for herself when she left. Ashley: Okay. Great. So then let’s kind of move into what was that process like? You said you wrote it with your sister so how did that process sort of come about and what does that even look like on sort of a day-to-day practical level of writing with your sister? Jeremy: You know we had for us we both agreed up front that we’re process-oriented. I mean, writing is a very structured endeavor. People kind of—people who don’t write—sometimes it’s like well, they sit down and they start to write and it’s kind of from beginning to end. We approach everything from a very structured standpoint with note cards on the wall and everything. We kind of look at it like we’re trying to whittle a sculpture out of a block of marble and that takes multiple passes and multiple tools. But one thing we agree on up front is there has to be integrity in the process and what I mean by that is there is going to be structure. We’re going to figure out and when we disagree on things or we have ideas, we always have to defend those ideas. And if we can’t defend them, it really means that we’re just speaking from ego and we don’t want our ego in the story. So if I have an idea and she doesn’t quite understand it, I have to be able to defend it and vice versa. She may have those great ideas and if I’m just not quite there, she’s ready to defend it and we talk it through. That kind of conquers resolution. That’s an invaluable process because we maintain integrity of the process and I think to this day every script that we’ve written, that’s the process we’ve followed. Ashley: So what does that just look like? So you go through the outline and you’re both physically sitting in the same room; you have the note cards on a bulletin board, you’re spitballing ideas and then how long do you spend doing this—and correct me if anything I’m laying out there is incorrect—I’m kind of curious about what your process actually looks like. Jeremy: We try to be in the same room as much as possible. In the very beginning we were absolutely in the same room every single day and we color-coded note cards. We figured out what kind of story we wanted to tell. We figured out the structure of the story we wanted to tell. It was just a classical three-act structure. Is it more like an act one, act two a , act 2b, act three kind of thing and figured out what sort of a story it is and then we basically just go through with each act and figure out the story beats. We color-code the acts on the wall, and once we figure out all the story beats, there are a lot of ideas that get up on the wall and if something better comes along, we pull that idea down and we put a new idea. And once we’re pretty satisfied that we have something that we can actually start writing, we’ll start the writing process. We actually even do bad idea for any party before we actually start into the script which is all the bad ideas that we pulled off the wall. And then we actually start writing the script and we’ll just pull the card down. We’ll write those scenes and through that process we get to a first draft. We want to keep it structured so you have beat pattern you can follow but you also don’t want to take away the magic of the moment. And so we’re very open to that fact. Sometimes you start writing a scene and it just goes somewhere you don’t expect. We’re very much aware that happens and we want that to happen so we allow for that within the working structure. That makes sense. Ashley: And so once you’re on to the actual writing of the scenes, are you writing some scenes; she’s writing some scenes and then you get together and merge them or are you both sitting in the same room literally typing and one person’s looking over the other’s shoulder as the other person types? Jeremy: No, we’ll actually give each other assignments and we’ll give notes on each other’s scenes and some of the notes are simply just from just making sure we’re keeping this active rather than passive—that’s what scripts are; they’re action documents—and other ones are like wow something really just magical happened now. This is going to affect the rest of the story so we need to make sure that we want the character to go down this direction and how that’s going to lend itself to the rest of the story. So our notes will be basically somewhere within that paradigm. Ashley: And roughly speaking how long would you guys say you spend on the outline vs. the actual writing of the script just like a percentage. Is it 20, 40, 80, 60, what do you think the break is? Jeremy: You know that’s tough because each story’s different and as we continue to write the processes evolve because we don’t have the flexibility to be in the same room all the time anymore and so we will still do the same process virtually. Sometimes a story just is already there and it just happens very quickly. Other times we spend relatively speaking a lot of time on the outline and then the script comes really easily as a result. I think it’s really a case by case situation. I wish I could give you a blanket answer. I think the answer is we spend as much time as needed in the process. Ashley: No. That’s a great answer and I can totally see that. Jeremy: With an Evergreen Christmas she was on set and we were rewriting still every day with me being the director. Obviously you start working with your actors and you start seeing some of the acts that they can bring and create an environment that’s creative where they feel like they have a voice in the process as well and as a result, really great things seem to be spontaneous. There’s a little writing every day because an actor will come up with an idea or do something we want to be open to but again, it needs to reconcile and we need to be able to send it with the whole story and so that process really carries through during production as well and bringing other people into that collaboration. Ashley: One thing, I’m writing a script with someone right now and he has a very distinct voice which is one of the reasons why I’m writing it with him because I like his voice. How do you merge the two? Do you ever find that the pages you write are just written in a slightly different voice than the pages your sister writes and how do you kind of merge it into one document so that the entire script feels like it was written by one coherent person? Jeremy: From our perspective—and that’s a really good question and I think that that’s probably the biggest pitfall of an honest collaboration. I say an honest collaboration because there are a lot of pitfalls with collaborations that deal with ego and people just want their way—but during an integrative process as integrity is in place, to me the biggest pitfall is just different voices and we focus on the voice of each character and how that person speaks and we have a conversation about what is this person’s speech pattern? What is this person’s unique voice? And we agree on what that is so when we’re writing those characters, we’ve already talked about what that voice should be and it’s based on the character not based on our writing style. It’s funny, family will read the script and they’ll swear that Morgan wrote this plot and it turned out I did and vice versa and that happens all the time. It’s kind of funny, you know, like who wrote this? I’m happy about that because they don’t know. Ashley: Okay. So let’s take us kind of through that process now that we have the script. You’ve written the script and then what was sort of your first step to actually getting the thing produced? What did you do? Maybe you can take us through that process of having the raw script and actually getting to the point where you have financing and are shooting this thing. Jeremy: You mean Evergreen Christmas as an example? Jeremy: Films, especially independent films deals come together in so many different ways and so the way this came about that we had an idea; we were working with a producer who had an idea she wanted to do a Christmas film and we had this idea because our grandfather actually owns a Christmas tree farm so it was just kind of a random conversation that she wanted to do a Christmas film because it makes financial sense. They’re good and there are more family things and we had this idea of a story that we wanted to tell and so at that point being unknown, we said well, okay, we’ll write this on spec which is risky but we wanted to write the story and there was a captive audience that wanted to know and wanted to read the script so that was encouraging. Halfway through that process the financing on that deal completely fell apart and so we were like wow, well, okay that happens but that was kind of our carrot is that we thought the financing is there. All we need to do is deliver the product and this movie can be made. When the financing fell apart we had a major decision to make at this point. Were we doing this because we thought it would end in a deal or were we doing this because we want to tell a story and we want to do the writing. I was living in Malibu at the time and Morgan who was a Florida resident had flown down and she was staying with us for a month at this point. We really had sat down and we had an honest conversation and we both decided that we are going to finish this story. And we don’t know what’s going to happen with it but we started it and it’s really important that we finish it. If nothing happens with it, we can be proud of the work that we’d done. So we finished the story and I’m at the Palm Springs Film Festival the next year and run into the same producer and started talking that story, we finished it. She said oh, my goodness, I’d love to read it and she read it and absolutely loved it. At the same time Charlene and I were looking for a project to do together to take advantage of her skills because she’s so talented as an actress and a musician. And she actually composed the score for the film. And one thing just led to another that the producer got on board and started going out there raising the financing and people loved the story. They loved the idea and the financing came in place and really good people came on board. We started looking up places to film and where we could get incentives and putting the whole package together. Everything just kind of fell into place. We were really fortunate, but I think it’s because at the end of the day we didn’t stop. Writers write and you’ve just got to do it. You don’t know what’s going to happen after that. You can’t really plan unless somebody’s hiring you to write something. That is a completely different animal. Ashley: So I wonder—and this is kind of a quick aside—did the producer who ended up that you originally worked with and then I guess she ended up producing it ultimately, how did you meet her? I love to hear sort of just those details of how you actually met this producer originally. Jeremy: We actually were doing an event in Sarasota, Florida which is a really big arts town and they were doing kind of a round table and she filled in for that. We had met her at that, and she was just on her first feature actually. So this was years ago and we just kind of struck up a friendship based on mutual respect so that conversation was already out there, but at that point nobody had any idea where anybody’s career was going to go because I wasn’t even writing at that point when I met her. She was just on her first film which was showing there and getting ready to do her second film. Ashley: When you say an event, what exactly does that mean, like a film festival or like some sort of media event for your commercial side of the business? What was this event? Jeremy: Oh sorry. It was just a one-offer event. It was a screening to get feedback on films and so it was an idea that Charlene’s mother actually had because she was on the board of the Terracotta Film Festival at one point. They were tied into that network and they’re Florida natives so when you’re not in LA or New York. These states do need events to try to bring and to attract filmmakers. And Florida’s a place where a lot of films have been done especially when they had their incentives and Sarasota is a town where people like to go to an event to see if it would gain an attraction. The event was basically like a two-day screening of films where the audience was able to participate and get feedback on the films. Some films were complete; other films were kind of in development. We were working on a short film—this was actually the first short film—I didn’t mention it before because it never got finished, but we had shot a short film in the Florida area in the Tampa area with Charlene starring. An Evergreen Christmas, we GP’ed it and it was the first time we all worked together. It was a great project just looking down the way of finishing it. I’m so back-screened at that event, that’s a work in progress. Ashley: No problem at all. I like to dig into things and make sure it’s clear for me and for the audience. One other thing I wanted to just touch upon, something you said, you were writing a script on spec and it sounds like the financing fell through so you kind of lost touch at least temporarily with this producer. I just want to clarify. It sounds like you maintained full ownership of this material. The producer didn’t come in and try and make you sign some sort of an option agreement or ownership agreement ahead of time. Is that correct? Jeremy: Yes but there was a legal process with that and that’s the biggest thing, understanding for writers who are creating original content. I mean, if you don’t have a lawyer and have a working understanding of how the law works, I think is really imperative because one of the things that when the financing fell through, we said okay there was this idea and partly we were using some of our ideas but other parts using the idea of the film that the producer wanted to make because that’s the kind of film that she thought would sell. When the finances fell through, one of the things that we did is said okay, we don’t want to use those story ideas; we want to go deeper into our story ideas and base it more on our family and base it more on our personal experience with our grandpa and his Christmas tree farm in Michigan. So we had to draw up and credit to her and got a lawyer involved and said these are the story ideas that we brought to the table. We want to develop these ideas further. These ideas are based on our family and our personal experience and we just don’t want to clearly make down the road that these are our ideas. And so we drew up a document and she signed it. She didn’t have to but she honored the process and we were very clear that we weren’t going to use any of her ideas and we didn’t. And when she read our final screenplay and she was not being really pleased obviously with the story we came up with but also that we honored our agreement that we weren’t going to use her ideas as well. So there was a legal process associated with that. That could have gone completely differently and oftentimes it does. Ashley: So then she’s re-involved. You meet her. You give her the complete script. She read it; she sees her ideas are not in it, then did she say hey, what about putting some of my original ideas back in it to get this thing financed? Jeremy: No. We never had that conversation. She is a producer so she’s always going to have ideas and always I think a good working relationship with the producer, you honor the ideas and she understood how we work it. By that point we love to listen to ideas. I think people who don’t want to listen to ideas, again, that’s an ego thing and she gave great notes throughout the process through subsequent drafts and everything. She gave great notes and we were very fortunate for that. Like with everything every note has to be defensible. When she gave notes that we didn’t agree with and she said it made perfect sense. Obviously when she gave a note, we’re like wow! That really helped unlock something for us. You know this is great but there was never the conversation about putting any of her ideas back in because it was just a different story at that point. It was its own story and it just would have been unnatural. She wouldn’t have done that because, again, our story went in such a different direction. Ashley: So you mentioned that you re-connected with her at this Palm Springs film festival. Was there a reason you were at the Palm Springs film festival? Was a short in the competition or you just were there just to check it out? Jeremy: Charlene was in a film that was showing at the Palm Springs film festival so being the good fiancé that I am, I accompanied her. Ashley: I wonder too. I get a lot of writers coming to me kind of asking about the process of raising the money. Were you at all involved in that. I wonder if you could give some sort of general tips for writer/producers who maybe want to try and shoot their own film and need to go out and raise some money. Jeremy: I was involved, especially being the director so you’re helping put the package together. I was also co—producer in the project so everywhere from where we set up the production, I had a say in that in helping to help formulate that because from that perspective for me the location needs a certain story obviously. You need to have a qualified crew that can help you tell the story and that’s really important and then you need to have some kind of premiere. For other people you need to have some kind of incentive package especially for independent films so you want to go to states that have all three of those that fit your story and not everybody goes through incentives first and incentives are third on my list getting to serve the story. If you’re not serving the story then why are you making the film? The question is having people that can help you tell the story. If you don’t have those people, you’re going to go over every single take. You’re just not going to get your vision in the camera. There’s a financial limit and you need people to help you do that. I think that raising the money obviously a really critical spin point because you can’t make a movie without it and you also can’t make a movie without a great script without actors who want to be in it, and all those things really go hand in hand. I see people a lot of times focus on just the money, and I think you lose a little bit of ownership of your creation if you just focus on the money. I think the money and the creation are really in a relationship and they both need to work for both parties. So I think philosophically just looking at it that way gives you more ownership of your process; it gives you more confidence and I think that when you go and meet with potential investors, that shows through. The other side of that is people kind of say well, the money’s just the money and they’re not creative and everything, I think that’s incorrect. I really think there has to be a symbiotic relationship because one can’t go without the other. Ashley: So I wonder if you can talk about sort of what’s on the horizon for you. I looked at your IMDB page and Radical Kindness, it looks like that’s completed and it looks like you’re working on a movie called Hushabye. I wonder if you can kind of tell us even in just broad strokes how those came about and do you think just in terms of your own career arc has one thing led to another? Have you gotten those things going independently? Jeremy: Yea, I mean, it’s really in place. The Hushabye project has kind of been put on hold because it was more like the spiritual horror genre, not horror but with the spiritual historical narrative approach. But my sister’s pregnant right now and we just determined that’s probably not the best time to write that story while she’s pregnant. You want the baby listening to Mozart through the little notch, not the mother thinking about these really stressful tense scenes so we put that on hold for a while. We’re into a couple of drafts of the script and we have a long way for it to go but we put that on hold. So we’ve been working on an adaptation of a classic 18th century English novel. That’s what we’ve been working on now and I’m also getting ready to produce another project that we should have deals signed for hopefully in the next week and that’s going to be a really big project. I’m just producing on that which I’m looking forward to because producing is a very different way of looking at the world; it’s very different than writing and while we’re working on some of these other scripts, it will be nice to work on somebody else’s script and provide value in that way and so it keeps the integrity again of the writing process in place where we can take our time and do it correctly. Ashley: Maybe you can just give us too kind of some ideas about how people can check out An Evergreen Christmas. Is it going to be released theatrically. Obviously it will come out in Video on Demand at some time. Maybe you have some release dates and you can tell us the best way for people to see it. Jeremy: It’s coming out November 4 which is next week so it’s releasing across all the VOD platforms in Wall-Mart, Amazon. We are not doing theatrical on it. The business structure is actually really hard these days, just the P&A that goes into it. So you kind of look at every film and see what is the life of the film and since it’s a Christmas film and it’s annual, we look at kind of a ten-year plan as far as what we want this film to be and how a multi-year strategy looks like doing VOD across every platform and in stores first and then we do Netflix. We go on Netflix on December 21 and then in subsequent years we’ll have a TV premiere and so on and so forth. We have a really great distributor, Arc Entertainment who have their pulse on it. I mean, distribution is changing rapidly. We are very fortunate our producer and executive producer have a great business background and great business sense and so we do look at these things objectively and do the spreadsheets and really get a plan together. Arc has been great with that. Ashley: I’m curious. Do you get any sense–a lot of the producers who I talk to, they still tell me the same thing with what you’re kind of saying—that family-friendly films are actually a very underserved market relatively speaking. Have you found that a Christmas story, even though it’s family, does a Christmas story play internationally? I’m curious if outside territories—obviously if it’s not a Christian country probably doesn’t play quite as well, but in Europe and stuff does Christmas stories play pretty well? Jeremy: Yes they do. The different structure of the foreign film markets are completely different. A lot of them have been generated through television over there and Christmas definitely plays. We’ve had a lot of pseudos on the foreign side because of that so yes, absolutely. It plays in the Middle East as well. We sold to the Middle East and we sold to Turkey I believe, but there are a lot of Christians in that. But it transcends that as well. There are just a lot of people who love Christmas. I’ve been very fortunate to travel all around and live overseas. I spent a lot of time in the Middle East, and it’s amazing how much people love this ideal of Christmas like the snow and the Christmas trees and everything. That’s something that’s really transcended around the world. Ashley: Great! What’s the best way for people to keep up with you and follow what you’re doing? Would you mention your Twitter handle or website or anything like that. I can link to it in the show notes. Jeremy: My Twitter is—and I’m just getting this whole Twitter thing down. It’s a whole lot like releasing a film; people need to reach you and you’re interested. I’m admittedly a little bit behind on that type of stuff—but I’m also not an actor so I don’t need to be as up with that. But my Twitter handle is @jeremyeculver. I’m on Facebook. I don’t have a website at this stage. Ashley: Okay. Perfect. I will link to that stuff and I think I noticed that there was a Twitter handle for An Evergreen Christmas so I’ll find that and I’ll put that in the show notes as well so people can just click over and follow along. Well, Jeremy, you’ve been very insightful, lots of great information for screenwriters. I really appreciate you coming on the show and talking with me today. Jeremy: Well thank you. Thanks for having me. I’m happy to talk about this. I think independent film now is really important, that the community all supports each other because there are a lot of great stories out there that need to get out but it’s also a tough business so I’m happy to help any way I can. Ashley: Perfect. Well, thank you very much. Ashley: Just a quick plug for my email and fax blast query service. Just in the last year I’ve optioned four scripts, sold one script and got one paid writing assignment and all of this came from using my own email and fax blast query service. Here’s how it works, first you joint Sys Select. Then you post your log line inquiry letter in the Sys Select form. I will personally review your log line inquiry letter and help you make them as good as they possibly can be. Then you purchase the blast and I send it out for you. The emails are sent as if they’re coming from your email address so all replies go directly back to you. You can exclude specific companies if there are some companies you don’t want to send to for whatever reason; maybe you’ve already submitted to them. It’s easy to exclude them from the blast. To learn more just check out www.sellingyourscreenplayselect.com to learn more. So in the next episode of selling your screenplay podcast, I’m going to be interviewing writer/director/actor Angus Samson. Angus recently wrote, directed and starred in a film called The Mule. We talk about his career and how he broke in as an actor and was able to parlay that into writing and directing. He’s very entertaining, very Australian which is to say he’s just super-friendly and down to earth so keep an eye out for that episode next week. To wrap things up, I just want to touch on a few things from today’s interview with Jeremy. One of the main things that I really noticed is how he was able to maintain focus even when the project seemed to be going off track. He talked about having a producer. They didn’t get financing; things kind of wound down and then he still was able to maintain focus and continue to write this script and get it finished. This is very, very important because if you’re going to be a professional screenwriter, lots of projects are going to disintegrate on you. It’s just the nature of the business yet he was able to maintain focus and finish writing the script even after this letdown and he was able to maintain a friendly enough relationship with the producer to pick back up a few years later. I mean, this is so important, building and maintaining these relationships. It’s also worth noting he was out and about at a film festival and he re-connected with this producer. I mean, that’s really how this business works. On the surface it might seem coincidental or lucky but you’ve got to put yourself out there enough that you’re going to find these sorts of moments where luck seems to shine on you. It’s just the old story, you know if you have a one in a million chance of actually hitting that lucky break, you’ve just got to do that thing a million times and at some point you actually have the odds in your favor. So that’s really the main take-away for me, maintaining focus, maintaining relationships and keep trying to work on the projects even when you hit roadblocks because you’re going to hit roadblocks with every project you work on.